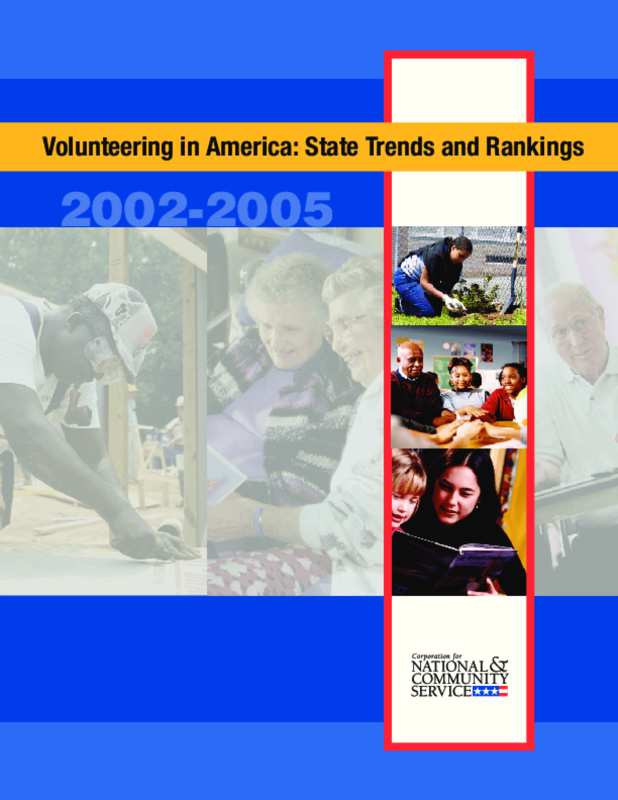 This summary report, Volunteering in America: State Trends and Rankings, displays an overviewof volunteering at the national level and the state rankings on indicators such as volunteeringrate and intensity, volunteering among seniors, and volunteering among college students andyoung adults. The full report, available at www.nationalservice.org, provides an overview of volunteering at both the national and regional level and presents state rankings on various volunteering indicators. The full report also contains two-page state profiles for each state and the District of Columbia and displays detailed volunteering information never before reported at the state level. These state profiles include information on the number of people volunteering, the volunteering rate, the number of hours volunteered, the primary organizations at which volunteers perform work, and the types of activities volunteers perform in each state. Copyright 2006 by Corporation for National and Community Service. All rights reserved.